Every morning, the president’s advisers assemble a summary of key news and security topics for him to digest over breakfast. Here’s a handy Google feature which will do the same thing for you! 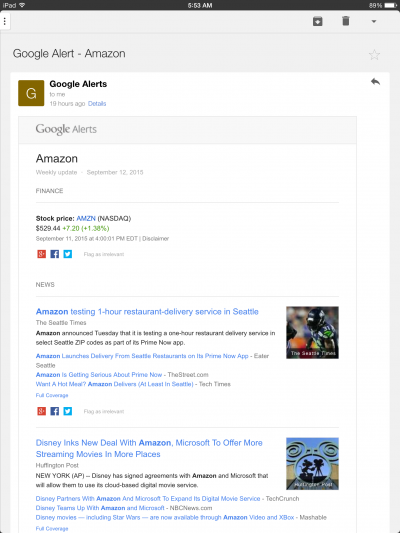 It’s called Google Alerts, and it’s very easy to set up. You basically establish search criteria, and then a frequency for receiving the information. The content get’s summarized and packaged for you, and delivered via email to your inbox. This can be a very handy tool for getting alerts on companies or industries in which you are an investor, or for getting some recent news on a competitor. easy to set up and it’s free! If you wanted to get the alert on Monday morning at 8 AM, you have to first create the alert on a Monday morning at 8 AM! It doesn’t allow you to set specific day or time to receive the alerts summary. 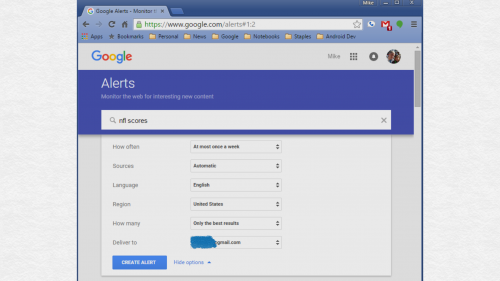 Once it’s been setup, you can always return to this same site to view content surrounding your alert. You can adjust the search string or frequency. If you use Google News, you can add this alert search string to a section on your http://news.google.com summary page. Or if you get sick and tired of getting the alert, you can always select the trash bin icon to delete it. So if you’re feeling presidential and want to get your daily dose of selective news or specific content, then try setting up Google Alerts! Do you have other presidential alert ideas such as this one? Then post your comment below!